Every EZSync cable is built to last for years with high quality industrial grade materials. The cable works with all Windows and Mac OS versions including the latest Windows 10 and Mac OS X 10.10(Yosemite) and 10.11(EI Capitan). This cable has 6 outputs: GND(Black), CTS#(Brown), VCC(RED), TXD(Orange),RXD(Yellow), RTS#(Green). 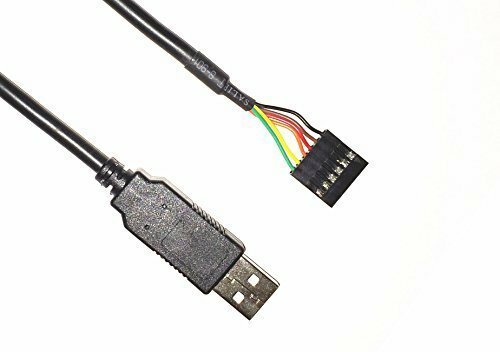 This cable can be used for a variety of applications: upgrading Legacy Peripherals to USB; interface Microcontroller UART or I/O to USB; interface FPGA / PLD to USB; USB Instrumentation PC interface; USB Industrial Control; USB Software / Hardware Encryption Dongles. Overmolded FT232R chipset provides single chip USB to asynchronous serial data transfer interface. Works with all Windows and Mac OS versions. If you have any questions about this product by EZSync, contact us by completing and submitting the form below. If you are looking for a specif part number, please include it with your message.